FREE FLASK FUNNEL WITH EVERY FLASK PURCHASED THROUGH THIS LISTING! Our store, Trinkets-n-Treasures, is located at 709 10th Street, in Greeley, Colorado. If you want to purchase and pick up your flask(s) from us locally, you may do so. If you have any questions about a local purchase and pickup, feel free to contact us thru this post. We will work with you from there. Our store hours are every Saturday from 9:00am thru 5:00pm, and every Sunday from 10:00am thru 5:00pm. We currently have 39 vendors with booths inside our Greeley, Colorado store, combining for a STORE FULL of shopping options for those who enjoy craft show shopping. We offer custom "lasering," which is different from "laser etching." Our laser is a 100-watt system that will burn into (and sometimes thru) glass, ceramic, wood, leather, and a few other common materials. Our machine cannot carve INTO metal objects, which is what "laser etching" is. Laser etching is handled by much more expensive machines, and costs considerably more than what we charge. With our plain stainless steel flasks (no leather wraps), we add 2-3 layers of your choice of metal adhesive color. Once those layers are fully dry, we laser burn thru those color layers, down to the stainless steel, as shown in the example picture. When you select our leather-wrap flask options, which you can select in the 4-oz, 6-oz and 8-oz sizes, we first add the 2-3 layers of your color choice. Once those color layers are fully dry, we then laser burn thru the color layers, and INTO the leather wrap. We don't burn all the way thru the leather wrap unless our customers specifically request it, because the black-burned look of the lasered leather wrap is more attractive. We apologize for the length of this post, but we prefer to provide ALL of the options our customers have, and it helps to fully explain them, too. This helps prevent our customers from having to wait for us to return their emailed questions. This post gives you your choice of two styles of 8-ounce flask options, while you can also choose the color of each flask ordered. What's even more fun is that YOU can determine exactly what is custom lasered onto your flask(s). These are flasks that have had leather wraps permanently added at the factor. They come all in ONE piece, with a permanently attached screw-top lid, too! We add 2-3 layers of your choice of color all over each flask before lasering work is completed on them. Once the color layers are fully dry, we then laser burn thru those color layers, and INTO the leather wrap, but NOT all the way to the stainless steel. What results is the that the burned-black of the leather wrap that is lasered shows thru the color layers around where the flask is lasered. See the leather-wrapped stainless steel flask example picture above. 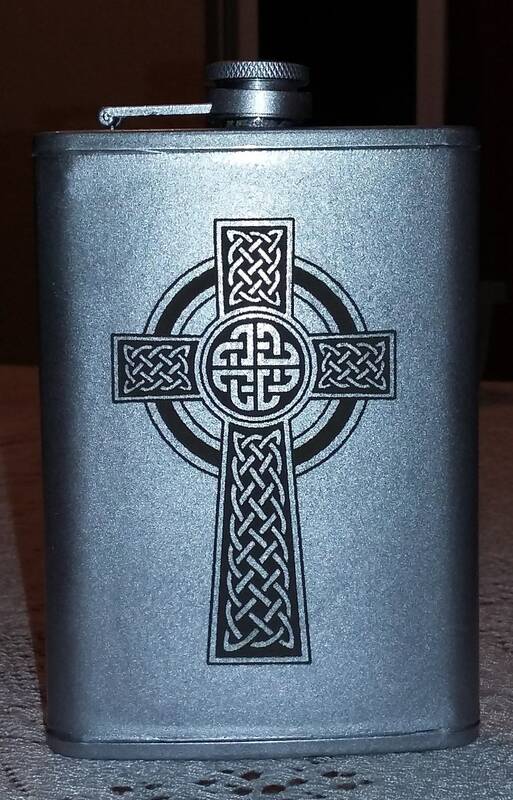 This particular flask option depicts a very cool Celtic Cross graphic, as see in the image attached. It is sure to start some fun conversations, whether you really use this flask for your favorite adult beverage, or if you simply display it where it can easily be spotted by friends, family, etc. For just $5.00 more per flask, we can customize your flask by adding something to the back side of your flask(s), too. Pleases realize, though, that this leather-wrapped flask style has a seam that tends to run right down the center of their back sides. If you want yours made in a different color, we can do that for you FREE of charge. Simply select your choice of color from the options listed below in this listing, and let us know at the time of your purchase. We will ship your stock or custom lasered flasks within anywhere from 2 to 4 days, depending on the time of year, and the size of your order. We strive to ship at least twice per week, every week. All in-country customers who purchase two or more flasks will receive a FREE upgrade to their shipping to the swifter "Priority Mail" option. That usually saves between 1 and 3 days on the in-transit time your package takes to arrive. This upgrade is given to you automatically, when you purchase two or more flasks from our Etsy store, and have them shipped to the same address, at the same time. You may combine purchases from our Etsy store in order to receive this shipping upgrade FREE OF CHARGE. Our FREE SHIPPING offer is valid only for in-country addresses. If you reside outside of the United States, unfortunately, we need to charge a significant addition shipping charge. This is due to the rising postage costs for things being moved outside of the United States. We want to support our customers who reside outside of the United States, but cannot afford to pay those costs ourselves. With that being said, we DO help our foreign customers by always marking the customs tags with "GIFT," to help them avoid also paying their local customs charges. You also do NOT have to stay with the color choice shown. You can request your flasks be made in any of the colors we currently offer. In fact, if you need more than one flask of this same size, you can order them all through this listing, and then just let us know the colors you want them each made in. If you don't see a favorite color listed here, feel free to email us with your request (tntptp@gmail.com), and we'll look into it for you as quickly as we can. Thanks again for shopping here in our Etsy store, and we look VERY forward to helping create just the right flask order for you.